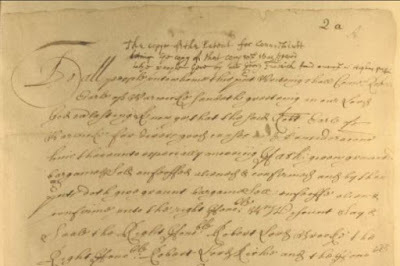 Connecticut’s leaders feared that the new English government would attempt to assume absolute control over the Puritan colonies in New England. 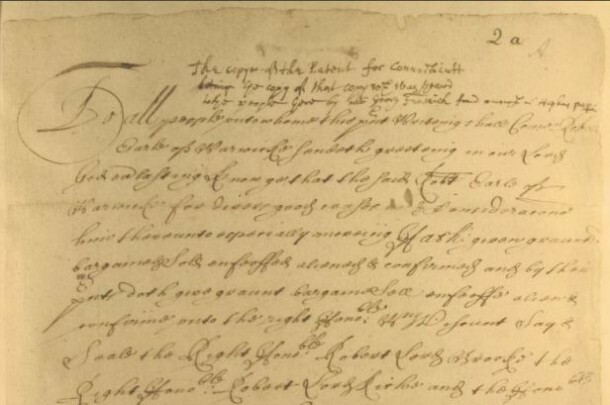 Connecticut’s leaders decided, therefore, that their best hope for preserving their liberties lay in petitioning for a legal charter from Charles II. John Winthrop Jr., Connecticut governor, was chosen for this critically important task. He sailed for England in July 1661 and succeeded, with the help of Lord Saye and Sele, Lord Brooke, and the Earl of Manchester, in securing a Charter for the colony in May 1662. [Source: ConnecticutHistory.org]. --NOW KNOW YEA, that in consideracion thereof, and in regard the said Colony is remote from other the English Plantacons in the Places aforesaid, And to the end the Affaires and Business which shall from tyme to tyme happen or arise concerning the same may be duely Ordered and managed. NEVERTHELESSE, Our Will and pleasure is, AND WEE DOE hereby Declare vnto all Christian Kings, Princes and States, That if any Persons which shall hereafter Bee of the said Company or Plantacon, or any other, by appointment of the said Governor and Company for the tyme being, shall at any tyme or tymes hereafter Robb or Spoile by Sea or by land, and doe any hurt, violence or unlawful hostility to any of the Subjects of vs, our heires or Successors, or any of the Subjects of any Prince or State beinge then in league with vs, our heires or Successors, vpon Complaint of such injury done to any such Prince or State, or their Subjects WEE, our heires and Successors, will make open Proclamacon within any parts of our Realme of England fitt for that purpose, That the Person or Persons committinge any such Robbery or Spoile, shall within the tyme lymitted by such Proclamacon, make full restitucon or satisfaccon of all such injuries done or committed, Soe as the said Prince or others soe complayneing may bee fully satisfied and contented. And if the said Person or Persons whoe shall committ any such Robbery or Spoile shall not make satisfaccon accordingly, within such tyme soe to bee limited, That then itt shall and may bee lawful for vs, our heires and Successors, to put such Person or Persons out of our Allegiance and Proteccon: And that it shall and may bee lawfull and free for all Princes or others to Prosecute with hostility such Offenders and every of them, their and every of their Procurers, ayders, Abettors and Councellors in that behalfe. PULMVIDED, alsoe, and our expresse will and pleasure is, AND WEE DOE by these presents for vs, our heires and Successors, Ordeyne and appointe that these presents shall not in any manner hinder any of our loveing Subjects whatsoever to vse and exercise the Trade of Fishinge vpon the coast of New England in America, but they and every or any of them shall have full and free power and liberty to contynue and vse the said Trade of Fishing upon the said Coast, in any of the Seas therevnto adioyning, or any Armes of the Seas or Salt Water Rivers where they have byn accustomed to Fish, and to build and sett vpon the wast land belonging to the said Colony of Connecticutt, such Wharfes, Stages and workehouses as shall bee necessary for the Salting, dryeing and keeping of their Fish to bee taken or gotten vpon that Coast, any thinge in these presents conteyened to the contrary notwithstanding.